Mad dogs and Englishmen go out in the mid-day sun, or so says the 1930s song by Noel Coward. And with average day-time temperatures in Barcelona ranging from 77 -88°F (25-31°C) during the hottest summer months, with a sizzling 99.3°F (37.4 °C) having once been recorded in August 2010, it pays to have some tips on how to handle the heat and humidity, especially for out of town visitors from cooler climbs. So, to make your trip as comfortable as possible here are a few practical suggestions to help you make the most out of your trip. There is a reason why siestas, the sleep in the middle of the day, used to be an integral part of people’s days; it was a much-needed way of dealing with the heat. Although the weather in Barcelona is not as fierce as other parts of the Iberian Peninsular, like for example in Andalusia, traditionally businesses would close for several hours in the middle of the day, when the sun was at is hottest, so that they could enjoy a long, leisurely lunch or take a nap. It is no accident that during the summer months here at Hi. This is Barcelona… we tend to start some of our Gothic Nights, which also gives a different perspective on the city. Barcelona is crammed full of shaded spots, which mean you can be outside without being in the full glare of the sun. Some of our favorite locations are within Parc Guell, the cloisers behind the city’s Gothic Cathedral (Catedral de la Santa Creu i Santa Eulàlia) and the charming Plaça Sant Felip Neri. With so much to see and do in Barcelona, you will often find you are pounding the pavements in orders to cram in as much as possible into your visit. But during the hot, summer months it is very important to make sure that you replace all the liquids that you will inevitably sweat out. A good idea is to carry a bottle of water with you. Better still, why not stop for a cool glass? One of our favorite brands of water is Vichy Catalan – somewhat of a regional institution. Their slightly-salty sparking water is strangely addictive! For me, having a hand fan in my purse is an absolute essential during the summer months. Essentially you are walking around with your own, personal, air conditioning unit What’s not to like? Also, it acts as a very stylish and an elegant reminder of your trip.One of our favorite, specialist fan stores in the city is called Kitsch in El Born, which has an excellent selection. You might not think that you will catch the sun just walking the streets, but you would be surprised how quickly the fairer complexions can burn without the right SPF. As you would expect lotion can be readily sourced from pharmacies as well as also chains such as Clarel and El Corte Inglés, both have stores at multiple locations throughout the city. Being on the coast, the Mediterranean might seem to be the most obvious option for taking a dip to cool down. However, the city not only also has a number of hotel roof terraces featuring pools that open their doors to the public, which usually also have spectacular views, but also there are several municipal pools that offer the perfect location for those wanting to have a cooling swim. For some of our favorite hotel terraces check out our dedicated blog post on the subject. And for the cream of the crop of the municipal offerings we highly recommend visiting the Piscina Municipal de Montjuïc, which was once described by The Guardian as “the world’s best swimming pool“. Who doesn’t enjoy a refreshing ice cream, sorbet or frozen yogurt as a way of cooling down on a hot summer’s day? Some of our favorite places to visit are Cremeria Toscana and Vioko. However, you should definitely consider sampling a chilled drink of horchata, (or orxata in Catalan), which is a very typical drink enjoyed in the summer month in both the provinces of Catalonia and Valencia. One of our favorite orxaterias is El Tío Ché. And if all else fails, embrace the heat and unleash your inner Kylie – the Australian pop princess, who’s promotional video for her 2003 hit “Slow” was filmed at the Piscina Municipal de Montjuïc. Check out the incredible panoramic views over the city at the start of the video. 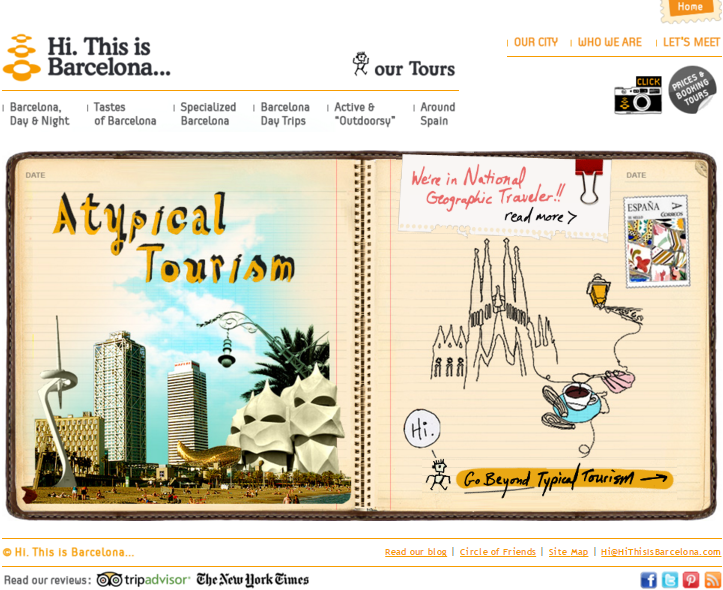 This entry was posted in Barcelona and around, Barcelona Holidays, Exploring Catalonia, Food and Drink and tagged Barcelona, Cool, Dip, Hand fan, Heat, Horchata, Hydration, Icecream, Orxata, Pool, Shade, SPF, summer, Sun, Sunscreen, Swim, Vichy Catalan, Water. Bookmark the permalink.